My Christmas was pretty mellow this year. No one came to visit and I didn't go visit anyone. Lots of presents were opened and there's still some late presents trickling in from the family. I put together a wishlist every year which Doug and my family go off of. I decided to start doing it this way because I used to always end up getting a bunch of stuff I didn't really want. So this has worked out pretty well until this year... I ended up getting two of a bunch of stuff. Doug and my family didn't communicate on what they were getting me so I ended up with two PC tuner cards, two down comforters, and two sets of frying pans. I also got a 19" flat screen monitor, backup drive, more wax for making candles, and a few sweaters. We had an outage in our network at work and Doug ended up getting called just about when we were going to eat. He ended up having to stay on a conf call for hours. Nice timing, but he was able to eat dinner a the table I set with my new china I got last year so it ended up working out ok. I took a pic of the dinner table with my cell phone. 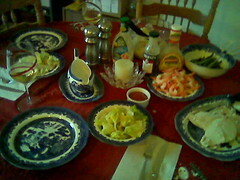 We had turkey breast, shrimp, salad, and asparagus.